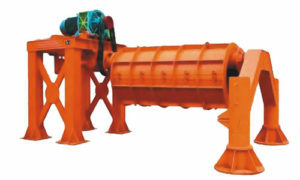 Firstly, this type of pipe making machine adopts new structure with two supporting points. Hence it has the advantages of compact structure, good stability, convenient operation and high rate of finished products. In addition, this machine is capable to make pipes with diameter from 800mm to 1500mm and with length 2500mm. Furthermore, we can design many kinds of the pipe joint, including flush joint, socket and spigot joint, male and female joint. Finally, automatic seam welder is a special product in this system, and which has gained us high reputation in our customers. Workers prepare the steel cage ,this cage can be made by manual ,also can be made by automatic machinery ,this machine could weld cage by automatic way. Use 5-10Ton crane to lift steelcage into mould, then use screw nut to fix the mould. JS500 or JS750 mixer mix the cement, sand, stone material, then feed to the mould by automatic material feeding belt conveyer system, and the mould will be under the high speed running, the material will be press into mould through main machine main shaft. After 3 hours ,we could open the mould , then we have 5-7 days water curing .